What an amazing year at the CandEs (as we’re known throughout the talent acquisition community–short for Candidate Experience)! The bar was definitely raised on improving candidate experience in 2018. This year, the North American Talent Board Candidate Experience Awards Benchmark Research Program included 200 participating companies willing to take a closer look at their recruiting practices and ask their job candidates to give them feedback about their recruiting experience and to rate those experiences. The candidates provided that feedback and 130,000 job seekers shared their thoughts and experiences via the Talent Board benchmark survey. Each year, Talent Board celebrates companies that are improving their recruiting processes and the overall candidate experience, touting them publicly and giving them special awards known as the Candidate Experience Awards (again, the CandEs for short). These four key data points were then run through a calculation creating a value ranking–what we call our CandE Score–which then identifies the strongest companies with the highest positive candidate ratings and, ultimately, this year’s winners. To qualify, each company had to commit to a statistically significant candidate response, and the proportion of respondents not hired also had to exceed a set standard. No other candidate experience research effort meets these strict standards. It’s also important to note that the majority of candidates who participated in the North American CandE research this year–92 percent overall–were those who were rejected, hadn’t heard back on next steps wherever they were in the recruiting process, or did not know of any offer at the time they completed our survey. Talent Board has found that these candidates have a greater aggregate impact on the business and the brand than those who are hired. More than an awards competition, the Talent Board serves primarily as a benchmarking program to raise awareness of the benefits of a positive candidate experience and highlight the tools, technology and techniques that can facilitate the process, as demonstrated by CandE-winning companies. Nearly 70 percent of this year’s employer research participants were from the technology, services, financial and healthcare industries, with financial employers increasing 34 percent from 2017. Just over 50 percent of employers generate over $1 billion in revenue annually, but there were smaller companies that participated in the 2018 North America benchmark research. 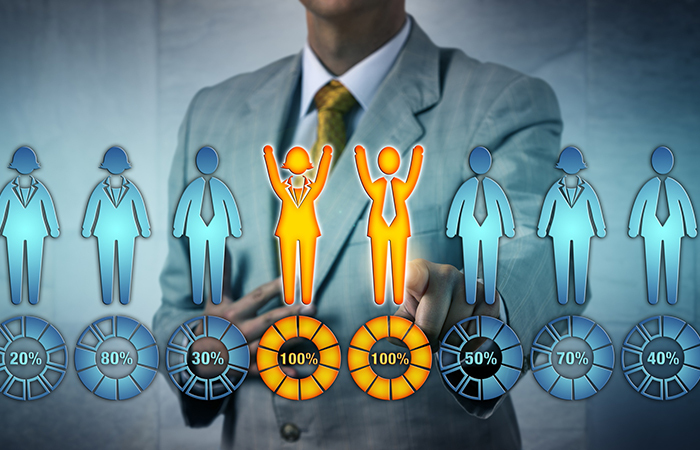 Employers can and do vary how their talent acquisition operational models are set up. For example, usually the majority of the models fall into these types: centralized, decentralized and outsourcing large portions of their talent acquisition to third party vendors like recruitment process outsourcing firms. Companies do tend to move from one model to another every few years; the centralized model decreased in 2018 by 13.2 percent from 2017, and the decentralized model increased in 2018 by 39.1 percent from 2017. What’s even more interesting is the fact that outsourced recruiting increased in 2018 by 59 percent from 2017 (see Figure 4). Lastly, when it comes to operational models, the outsourced candidate experience was much better compared to the centralized and decentralized models when you look at those candidates who were extremely likely to refer others based on their experience — up to 22 percent better (see Figure 5). Because many RPO firms today have improving candidate experience in their service level agreements with companies, it behooves them to excel in this to ensure long-term relationships remain intact. A company’s overall candidate experience has a definitive potential impact on the business, and that impact is definitely improving incrementally from talent attraction through to onboarding. The majority of North American employers in 2018 (64 percent) describe their overall candidate experience as leading or competing, nearly 25 percent as improving and a small few (less than 2 percent) as lagging (see Figure 6). When you compare data over the past six years, the distribution of CandE Awards winners versus all other participating companies who rate themselves as leading had widened dramatically, but dropped back to a 36 percent difference from 2016 to 2017, and now in 2018 was only a 33 percent difference. What’s more interesting is that, although the mix of companies that participate changes each year, and the variables impacting recruiting and candidate experience fluctuate, those that felt they were leading in candidate experience decreased by 45 percent compared to 2017. That’s quite a dramatic decrease. In contrast, global job candidates gave employers a great candidate experience rating that was 17.4 percent higher than in 2017. The rating, one of many we capture each year, is based on asking the candidates how they will change their business relationship status with the employer they had applied for a job at. However, the weight of disparity ultimately falls on the perception of the rejection experience, and when you compare how employer self-assess the rejection experience they provide and how the candidates actually perceive the experience in North America in 2018, there’s a 25.5 percent difference in ratings, with the candidate ratings being lower (see Figure 7). Year after year, Talent Board CandE research shows that communication and feedback loops are ongoing differentiators of a more positive candidate experience. However, most participating employers are only asking for feedback after the candidates are hired (35.7 percent in 2018, which is a 34.2 percent increase from 2017). And while only 19.5 percent are asked for feedback after they are interviewed but before they are hired, that’s a significant increase of 43.4 percent from 2017. Plus, the percentage of companies that don’t survey candidates decreased 49.6 percent from 2017, another significant change (see Figure 8). While we don’t ask employers about hiring manager performance and candidate experience per se, we do ask if they give feedback to the candidates who have interviewed as finalists and who have not been selected, and if hiring managers are required to do so. Fewer than a third of the 200 participating North American employers responded that their hiring manager give feedback to candidates, and by a huge margin internal candidates get the bulk of the feedback. Improve Candidate Engagement Pre-Application: We saw a 69 percent increase in utilizing chat bots on career sites in 2018. More employers realize that a competitive differentiator is communicating earlier with candidates, even before they apply. Chatbots are being used to answer general employment questions and this frees up the recruiting teams to have more hands-on time with potential candidates already in play. Referrals Are Critical: It goes without saying that employers depend on referrals for quality candidates. And while 30 percent of candidates in 2018 still cited employee referrals as a valuable channel, down 17 percent from 2017, 42.7 percent of referred candidates were much more likely to increase their relationship with a potential employer (apply again, refer others, make purchases if and when applicable), more so than if they conducted their own search or if they received unsolicited outreach from a recruiter. A Fair and Simple Application Process: Perceived fairness continues to be a differentiator in candidate experience, and there’s a no better crossroads of this than at the application process. This is as far as the majority of applicants make it today in the recruiting process, and there was a 128 percent difference between those who felt they were being treated the most fairly, 4.4 out of 5 star rating, and those who rated application fairness the lowest, just about 1 out of 5 stars. And 42.5 percent of the candidates who rated the application process 5 stars said the application took less than 15 minutes, a trend we continue to see with many companies. Job Simulations and Culture Fit: Assessments help employers make better hiring decisions, and according to our data, many types of assessments were going strong in 2018. Two types that stand out and saw a significant increase in utilization were 1) job simulations that help to assess how candidates may perform on the job increased by 16 percent, and 2) culture fit assessments that identify how well potential new hires will assimilate into the organization increased by 17 percent. Immediate Feedback Pays Off: Candidates who were interviewed and then given job-related feedback by end of that same day said they were 52 percent more likely to increase their relationship with the employer (apply again, refer others, make purchases if and when applicable). Whereas, if feedback was not given, they’re more than twice as likely to sever the relationship (8 percent vs. 2.6 percent). This was greater than even those who were given just recruiting process feedback at the end of the day (next steps), which still included 41 percent of candidates more likely to increase their relationship. Let the Candidates Shine: The only way to truly know if candidates are qualified is by giving them a fair opportunity to present their skills, knowledge and experience during the screening and interview process. Of candidates who gave a 5-star rating for the screening and interview process, 73.8 percent were extremely satisfied with their ability to do just that, while 53 percent of the candidates who rated the experience 1-star told us they were extremely dissatisfied with the screening and interview process. Pick Up the Phone: The types of rejection communication candidates receive when they were no longer being considered after the screening and interview process can make a big difference in whether or not they apply again or refer others. According to our data, these included automated email replies (58 percent), personal emails from recruiters and hiring managers (22 percent), and personal phone calls from recruiters and hiring managers (only 10 percent). The positive candidate ratings jump upwards of 32 percent when they receive a phone versus the automated email rejection, a big difference that can go a long way. The Onboarding Win: Although one of the least frequent new hire offerings according to our research, when employers offer their new hires multiple options to communicate goals, meet key team members, answer questions, all prior to their start date, new hires are 72 percent more likely to increase their relationship with the employer (apply again, refer others, make purchases if and when applicable). This is also critical to ensuring retention and building the bridge from candidate to employer experience. Recruiting Structure Can Make a Difference: An employer’s organizational recruiting structure usually encompasses one of the following: centralized (dedicated recruiters, recruiting org structure and budget, decentralized (division/line of business dedicated recruiters, org structure and budget), and outsourced (RPO, HRO and third party vendors). We found that those who outsource recruiting had candidates say they were 22 percent more “extremely likely” to refer others based on their experience than decentralized recruiting organizations, and 16 percent more “extremely likely” to refer others based on their experience than centralized recruiting organizations. The Business Impact of Candidate Experience The past few years Talent Board has been focused on the business impact of candidate experience from pre-application to onboarding. And for good reason. Candidates who believe they have had a “negative” overall experience tell us every year they will take their alliance, product purchases, and business relationship somewhere else. This means a potential loss of revenue for consumer-based businesses, referral networks for all companies, and whether or not future-fit and silver-medalist candidates apply again. The good news is that the willingness of candidates to increase their relationship with an employer trends upwards globally over the past three years. In fact, global job candidates gave employers a great candidate experience rating that was 17.4 percent higher than in 2017. Plus, the willingness of candidates to sever their relationship with an employer only trends upwards in North America, with it flattening in EMEA and declining slightly in APAC over the past three years.